The Arium Process is a systematic, step-by-step approach to design and technical problem-solving proven to keep costs down and quality high. We specialize in helping clients realize their project goals and navigate a dynamic regulatory environment on budget and within schedule. The kickoff meeting establishes project scope, priorities and goals, and schedule. At this stage, we review and copy for file all available existing as-built contract documents. If required, our team visits the site to measure/confirm existing conditions, including walls, doors, windows, and columns. Arium prepares CAD floor plans based on the field survey notes and provides a PDF copy to the client. When appropriate, we can also bring in our in-house mechanical and electrical engineers to identify opportunities and code issues. Code research provides an understanding of possible Building Code and ADA issues that can affect the process as we move forward with the project. During MEP Input, our in-house mechanical, electrical, and plumbing engineers are engaged early in the process to develop a comprehensive understanding of the project, existing conditions, and potential challenges. Our ability to engage all disciplines early in the project contributes to the efficiency of the Arium design process. This is one of several key opportunities you will have for review and approval as the process progresses. At each of these points, the design team will present current work and discuss comments, questions, and revisions that need to be incorporated in the next phase of the design—or, in some cases, an entirely new iteration may be required. Arium has LEED-certified professionals on staff with experience assisting clients in LEED Project Certification process. It's important to identify LEED goals for the project early on and develop a realistic understanding of budget and project feasibilities. We can provide LEED documentation for projects from seeking any level of LEED certification. 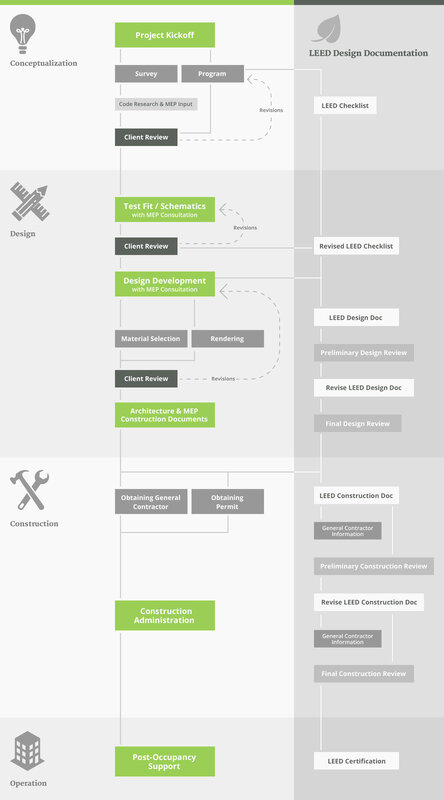 A basic outline of LEED credits presented in a format for evaluating the project and informing the basis of design intent. Using the base plan and programming information we create a test layout of the proposed space, showing walls, doors, columns, and room names. We can provide test fits for each space, to help tenants shopping for the perfect space to visualize their program within the space. MEP Consult - Arium's integrated design studio allows for early engagement and higher levels of coordination between architects, interior designers, and engineers. During the Test Fit phase, engineers may highlight concerns with the new program in response to existing building systems and other factors. Using the programming information provided by the client or user, Arium creates a plan that sets forth the full range of design decisions. The DD plan describes the location of all electrical outlets, data-telephone drops, deck to deck walls, locksets, vision panels, sidelights, upgrades, millwork, supplemental HVAC, accent painted areas, and any other client requested items. Clients may choose to seek a budgetary cost estimate for the project using the DD plan. MEP Consult - Arium's integrated design studio allows for early engagement and higher levels of coordination between architects, interior designers, and engineers. During the design development phase, Arium's architects and engineers work together to ensure a common understanding of the client's needs. Arium's in-house library provides thousands of materials and products to choose from. Our designers stay current with industry trends and products and are happy to provide sample collections for each project. These collections can be based on clients' established standards or custom created for their unique project needs. If your project requires renderings, Arium utilizes the state of the art computer modeling software, and can provide a range of digital visualizations—from process sketches to photo realistic renderings. We are happy to work with you to discuss which type may be right for your project. Based on the client-approved design development plan, with any changes noted, Arium produces dimensioned, noted, and stamped architectural and MEP drawings for permit submission, bidding, and construction purposes. We can review the project for conformance with the new International Energy Code requirements and make any recommendations for compliance. Revise checklist utilizing most current information discovered during conceptualization phase. We will assist the client in registration of the project with USGBC and complete documentation for each project credit per stated requirements. We will submit the design documentation for the project to USGBC for preliminary review and respond to any comments or requests for additional information. Arium will revise LEED design documentation per USGBC request, and updated per the most current construction documentation. We will submit the final design documentation to USGBC for the project. We can assist in bidding and obtaining a general contractor for the project. Arium completes hundreds of projects each year within the Baltimore / Washington region. Each local jurisdiction is different, but repeated exposure ensures that we excel in preparing and submitting forms and maintaining contact to assure progress is being made. We respond to all inquiries, revise and resubmit plans if required, and contact the client when the permit is approved and ready for pick up. Please contact us if you have questions about the permitting process in your jurisdiction. Arium will complete documentation for each project credit associated with the construction phase. Many credits will require information that is to be provided by the general contractor. Arium will gather this information and compile it per USGBC requirements. We will revise the construction documentation based on USGBC comments and updated information made available by the general contractor. We will submit the final construction documentation to USGBC for final review of the project. Our in-house mechanical, electrical, and plumbing engineers are engaged early in the process to develop a comprehensive understanding of the project, existing conditions, and potential challenges. Our ability to engage all disciplines early in the project contributes to the efficiency of the Arium design process. Arium's integrated design studio allows for early engagement and higher levels of coordination between architects, interior designers, and engineers. During the Test Fit phase, engineers may highlight concerns with the new program in response to existing building systems and other factors. Arium's integrated design studio allows for early engagement and higher levels of coordination between architects, interior designers, and engineers. During the design development phase, Arium's architects and engineers work together to ensure a common understanding of the client's needs. Arium completes hundreds of projects each year within the Baltimore/Washington region. Each local jurisdiction is different, but repeated exposure ensures that we excel in preparing and submitting forms and maintaining contact to assure progress is being made. We respond to all inquiries, revise and resubmit plans if required, and contact the client when the permit is approved and ready for pick up. Please contact us if you have questions about the permitting process in your jurisdiction. + General Contrator Information: The general contractor will provide final documentation as required by the project specifications. Arium will compile this information per USGBC requirements.